Disney's Latest Talking Dog Caper: Enter To Win One Of Three Super Buddies DVD's! Have you heard that The Buddies are back? We're so excited that we're suspending today's regularly scheduled prgramming to bring you this spectacular giveaway! Please see details at the end of this post to enter to win one of three DVD's of Disney's most recent Buddies action-packed flick, Super Buddies. Note: We added one additional and easy requirement to enter. If you remember our previous Buddies movie reviews and giveaways, you know we're a fan of those "way too cute for their own good" Golden Retriever pups. And not only are they adorable, they talk and, well, help save the world! Does your pooch do that? Didn't think so...neither do I. 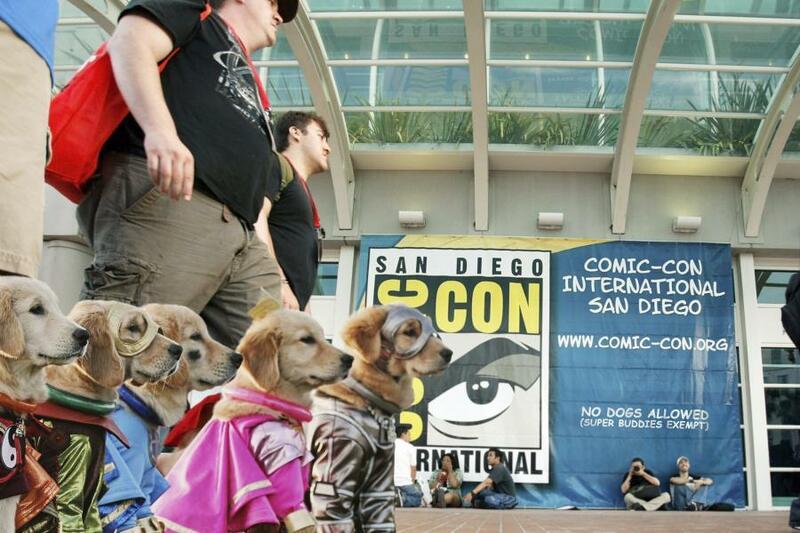 Check out the Super Buddies visit to Comic-Con earlier this year. Super Buddies will be available on Blu-ray combo pack and DVD starting August 27th, 2013, and they're available for pre-order right now. Please note: If the rules are not clear to you, feel free to ask any questions at: jdemarti@columbus.rr.com. Likewise, if you've chosen to enter, please check back at the appointed day to see if you're a winner. And if you're one of the lucky ones, please provide your mailing address to Parental Unit at the above e-mail address. Thanks! Three lucky winners (continental U.S. only) will receive one Super Buddies DVD from Disney! Here are the requirements to enter: No anonymous comments, please! 3. You must give this giveaway a shout-out on your Twitter or Facebook page by using the buttons below this post-easy! 4. Comment on this post and indicate in your ONE comment that you'd like to enter this giveaway. This contest will run from today, Sunday August 18, 2013 through Tuesday August 27, 2013 at 8:00 EST. Ignore us as we are across the pond. Have a marvellous Monday. We arrived here and we follow you and also on Pinterest:) Love the super dogs! I would LOVE to win the Disney Buddies Movies. Schooner and Skipper LOVE to watch movies with our triplet grandchildren! Plus Schooner and Skipper love watching movies with us on movie night with popcorn! I would like to enter the giveaway. I have already liked your facbook page, did the google connect and shared it on twitter. I love the Buddies movies. Thank you! I would like to enter the giveaway. My daughter would love this movie! Would love to win the Super Buddies DVD, my family loves the Disney Buddies!! Yep, I'd like to win the Super Buddies Dog DVD's. Just finished reading The Art of Racing in the Rain by Garth Stein. It was a book told from the point of view of a dog and the other main character was a race car driver. Don't have Facebook. But like all things dogs. My 3 kids LOVE Super Buddies!